Being a customer centric entity, we are involved in providing an extensive range of Handheld Metal Detector. The product is enormously applauded for its longer operational life. We are providing wide range of Hand Metal Detector that offers high efficiency, reliable performance and requires low maintenance. Our range of metal detectors operates on 9v battery and used in Hospitals, Showrooms, Railway Stations and Temples for detecting all type of ferrous and non ferrous material. Various types of hand held metal detector. 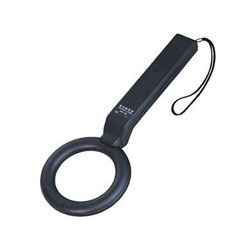 We are the largest supplier of Hand Held Metal Detector in Bangalore, Karnataka, India. This metal detector is manufactured using premium grade raw materials as per the set industrial standards. It has been provided with both audio and vibrating mode. It weighs 409 grams approximately with dimensions of 41(L) x 8.5(W) x 4.5(H).